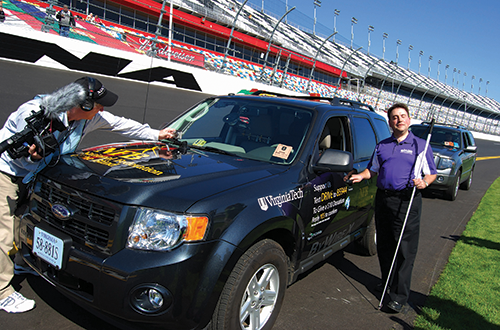 Mark Riccobono could certainly be excused if he was feeling nervous at the prospect of driving a demonstration car before a crowd of Rolex 24 race fans at the Daytona International Speedway back in 2011. After all, he was a beginning driver. Also, Riccobono, president of the Baltimore-based National Federation of the Blind, has been blind since early childhood. Driving a Ford Escape SUV outfitted by a team of robotics students and professors from Virginia Tech with semi-autonomous vehicle technology developed by Blacksburg-based Torc Robotics, Riccobono successfully piloted the vehicle through a 1.5-mile course with turns and obstacles. Sensors on the car provided information about the roadway to Riccobono via vibrating, haptic-feedback gloves that signaled steering instructions to him. Before long, not even a steering wheel may be required to drive. 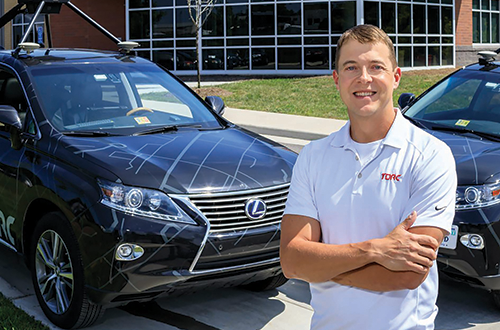 Last summer Torc Robotics, which has partnerships with NXP Semiconductors, Nvidia Corp. and the American Automobile Association (AAA), outfitted a Lexus RX hybrid with software and hardware upgrades that allowed the car to drive completely autonomously for 4,300 miles on a trip from Virginia to Seattle and back. 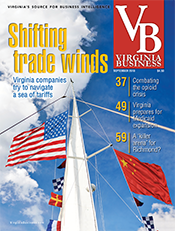 As the automotive industry moves us tantalizingly closer to a sci-fi future of roadways thrumming with such self-driving cars, Virginia has positioned itself as a hotbed for developing and testing autonomous vehicle technologies. 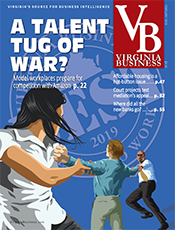 This is in large part due to innovative research work coming out of state universities such as Virginia Tech and the University of Virginia, as well as companies like Torc. Created by Virginia Tech alums, Torc develops self-driving technologies used in mining trucks and military vehicles. That momentum, however, may be affected by regulators’ reaction to the first fatality of a pedestrian involving a self-driving car. Uber Technologies temporarily suspended tests of self-driving vehicles in March after one struck and killed a woman walking with a bicycle at night outside of a crosswalk in Arizona. The incident was still under investigation as this issue went to press. Proponents of self-driving cars believe they will have the potential to reduce accidents and fatalities significantly because they eliminate human error. 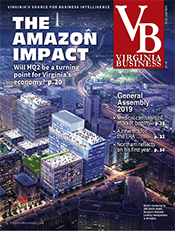 These vehicles also are expected to reduce traffic congestion such as the snarls and backups that perennially plague Interstate 95 and the Beltway corridor in Northern Virginia. But self-driving vehicles also could bring a host of less obvious but equally revolutionary changes to our daily lives. There also will be entirely new customers for self-driving vehicles — for example, the blind, disabled and elderly. “There is a huge market for this for people who aren’t terribly well served with the transportation and mobility options they have now,” says Stertz. 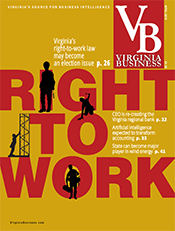 A lobbyist for the Unmanned Systems Association of Virginia, Michele Satterlund with McGuireWoods Consulting in Richmond, calls Virginia “one of the best-kept secrets” in the autonomous vehicle industry, noting that companies and universities are testing this technology on public roads and private courses around the commonwealth virtually every day. She credits this involvement in part to a welcoming attitude by state government officials and legislators. They generally have let the marketplace evolve but passed a couple of laws to help pave the way for self-driving cars. One recently passed law would allow self-driving vehicles to play videos on a car’s built-in instrument panel when the car is in a fully autonomous mode. This would permit a driver to watch a movie but still be engaged with the car’s instrument panel in case a warning or notification flashes up on the screen. 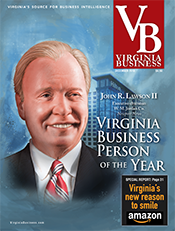 Last year the McAuliffe administration founded the Autonomous Systems Center of Excellence to help promote an entrepreneurial culture for autonomous vehicles, including aerial drones, while raising Virginia’s profile in related industries. And the Commonwealth Transportation Board has moved to allow testing of autonomous cars and trucks on express lanes on Interstates 95 and 495 in Northern Virginia. 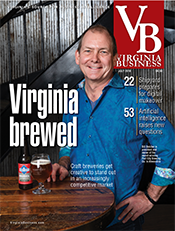 In addition to Torc Robotics, another Virginia company working on autonomous vehicles is Crozet- based Perrone Robotics, started in 2003 by CEO Paul Perrone, who earned his graduate degree in com­puter engineering from the University of Virginia. 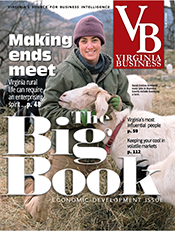 The company, which employs 21 people, announced last year it would be investing $3.8 million to expand its research and development operations in Albemarle County, with plans to add 127 employees by 2021. 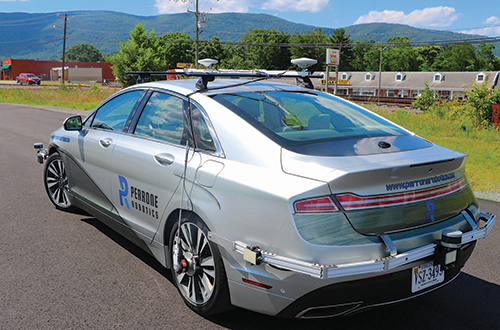 Perrone Robotics has developed a proprietary software platform for running autonomous vehicles called MAX. Perrone likens MAX to LEGO building blocks, in that the modular framework allows developers to swap out and add different software artificial intelligence capabilities for self-driving vehicles, such as stopping correctly at traffic lights, self-parking or avoiding obstacles. His company has received significant investment from Intel Capital. One of Perrone’s board members and mentors is Nolan Bushnell, the founder of Atari and Chuck E. Cheese. Perrone outfitted rock star Neil Young’s electric vehicle with autonomous technology. Working with smart-matching algorithms in computer simulations, she has found that, when paired with a robust transit system like the Metro in Washington, D.C., and Northern Virginia, using on-demand self-driving cars for carpooling could have a major impact on reducing traffic congestion and freeing up space now devoted to parking lots and decks. A lot of change, however, will depend on people’s willingness to adopt the technology, she says. Millenials accustomed to using on-demand ride services such as Uber and Lyft probably will be most willing to relinquish vehicle ownership. Trust in self-driving vehicles is a major barrier to implementation. An annual survey of U.S. drivers by AAA released in January found that 63 percent of Americans are afraid to ride in a fully self-driving car, with males and millennials being less leery. First-time passengers who’ve ridden in self-driving cars say that after about 10 or 20 minutes, they tend to forget they’re riding in an autonomous vehicle. But that’s not to say that the experience can’t sometimes be unnerving. Self-driving vehicles at times can exhibit some very unhuman-like behaviors, such as accelerating like a racecar on an interstate highway entrance ramp. And when confronted with a concrete barrier wall or a bicyclist, a self-driving car might be more likely to maintain its position in the center of the lane, instead of moving to one side, points out Madhur Behl, an assistant professor of computer science, systems and information engineering at U.Va. He and Lu Feng, another U.Va. computer science professor, are studying this question of trust in autonomous vehicles by using a full-scale driving simulator and measuring how passengers react to a vehicle’s actions. One of their aims is to determine whether a passenger’s confidence can be improved by adding a digital display explaining what a vehicle is going to do ahead of time. 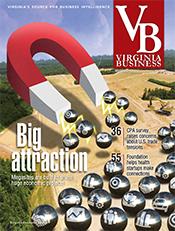 Perhaps the biggest engine for autonomous cars in Virginia is the Virginia Tech Transportation Institute (VTTI) in Blacksburg and its groundbreaking Virginia Smart Road, a 2.5-mile closed-access testing roadway in Montgomery County. Car manufacturers from around the globe come there to try out their latest self-driving tech wizardry. The Smart Road has weather-manufacturing equipment that can create rain, snow or ice. 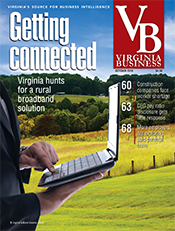 The roadway includes the second-tallest bridge in Virginia and a configurable urban simulation area. This fall VTTI will add a rural simulation area to the test road. If there’s a shiny, new technology available in cars, it’s a safe bet the researchers at VTTI were putting it through its paces long before it ever showed up in an auto dealer’s showroom. The institute started testing autonomous technologies such as automatic braking in the 1990s. “People for largely the last 30 years have been shipping us their cars to test and evaluate, and that has evolved into more and more automated features,” says Dingus. 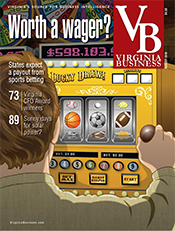 VTTI employs a staff of 500. Its clients include 60 automobile components suppliers and 14 major car manufacturers. The institute also has more than 100 sponsors and brings in about $40 million per year from its research projects. At last count, VTTI has approximately 60 projects in the pipeline involving autonomous vehicle technology. Dingus can’t discuss any in detail because of nondisclosure agreements (not entirely surprising in an industry known to drape test car models under tarps). So, when will we start seeing self-driving cars on the roads? When will these vehicles become the norm? Sooner than you think. Some might argue self-driving cars are already here in rudimentary forms such as those with adaptive cruise control, Fleming says. Also, certain industries, such as mining, have been using autonomous vehicles in closed environments for years. Level 0: Normal manually driven cars with no particularly intelligent features. Level 1: Driver still controls the car, but it has one automated driving feature such as adaptive cruise control. Level 2: “Hands-free” features such as lane centering, emergency braking and parking assistance may allow drivers to take hands off the wheel for short periods of time, but they must be ready to take control at any time. Level 3: Cars enable drivers to take their eyes off the road to watch a movie, text or read a book while the vehicle drives itself. Level 4: The car is able to drive itself under defined conditions. A human operator can take over in the event of an emergency. Level 5: Cars such as robotic taxis that are capable of fully autonomous driving without a human operator and don’t have a steering wheel or any visible controls. The process of self-driving cars becoming ubiquitous will be more an evolution than a revolution, Dingus says. By 2023, he predicts, self-driving taxis will become regular features in urban areas where on-demand ride services like Uber and Lyft already are popular. By 2035, about half the cars on the road will be advanced self-driving cars, and the market will hit 90 percent saturation by 2049, he estimates, as long as safety rates are acceptable to the public. 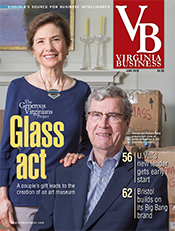 “For a long time, you’re going to have a mixed mode of traffic,” says Azim Eskandarian, head of Virginia Tech’s mechanical engineering department. “We’re obviously going to have a mixed mode of autonomy versus manual driving.” And that, he says, will present its own array of challenges, including questions such as who will be legally responsible in an accident involving a self-driving or remotely driven vehicle. The barriers to producing Level 5, fully autonomous, self-driving cars are physics and artificial intelligence, Dingus says. Self-driving cars just don’t yet possess enough sophisticated intelligence, sensors and visual equipment to handle the numerous decisions that drivers make every day in dealing with traffic, weather and road hazards. “Is there a technology ready to handle any situation in any environment? I would say no,” states Fleming with Torc Robotics.